Your trusted adviser and reliable source for accessibility solutions. Team of people who have experienced the impact of accessibility with 65% of the team being people with disabilities. Recognized global leaders in providing end-to-end accessibility services with expertise in Section 508, WCAG 2.0 and ADA compliance. Accessibility lab that has the latest assistive technology and wide variety of devices across various operating systems. Comprehensive solution that evaluates your accessibility needs. We ensure that your websites and mobile applications are Section 508, WCAG 2.0 and ADA compliant. Cost effective and reliable Accessible PDF, Accessible EPUB3 and Image Description service. We ensure that your documents are accessible to people with print impairment. Team of experts with diverse project experience in accessibility. We help you integrate accessibility right from the start and align them to your organizational needs. The task at hand to implement accessibility is quite daunting for companies. Implementing accessibility in your legacy system or new technologies in development or third party solutions can be a concern. Our accessibility testing services ensure that your products are usable by people with disabilities. Above all, we assist you in aligning the accessibility services to your organizational needs and strategy. 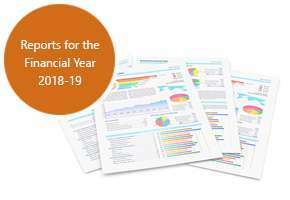 Organizations share documents and books with customers and stakeholders whether they be brochures, user manuals, corporate documents like annual reports. Furthermore, an increasing demand of eBooks makes it important that the content available is in the most interactive form to the readers. Our E-text services, Accessible PDF, Image Description and Accessible EPUB3 solutions, ensure that your content is accessible to all. 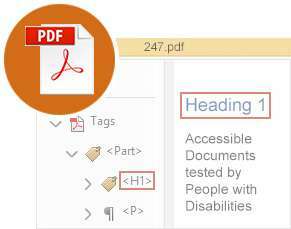 With expertise in WCAG 2.0, PDF Techniques and PDF U/A standard, we test your PDF with the PDF Accessibility Checker in Adobe Professional. Furthermore, the PDF team ensures a manual quality check on the tags and the content. EPUB3 pertains to the International Digital Publishing Forum (IDPF) standards. EPUB3 ensures content is made accessible to ALL including people with print disability. 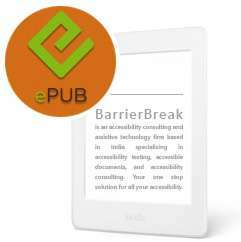 BarrierBreak can convert books into ebooks adhering to the Accessible EPUB3 format in the most cost effective and customized manner. Image Descriptions are an integral part of content accessibility. It ensures equal access to people who are low vision or blind the same information from an accessibility perspective. At BarrierBreak, we write concise and accurate image descriptions for all the images. Above all, we test them with people with disabilities ensuring accessibility for images. Identify currency, turn your mobile into a magnifier, detect light intensity – with a simple tap on your mobile. 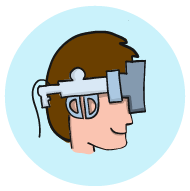 An experimental approach to low vision assistive technology using the power of the web, mobile devices and augmented reality. India’s only accessible media site focusing on disability, inclusion and accessibility. We are constantly working towards creating an inclusive society, a society where equal opportunity is provided, ease of access to employment, education, social life, and finally, encouraging independent living for all. As a result, through our various initiatives we assist you in your effort towards making an inclusive society. 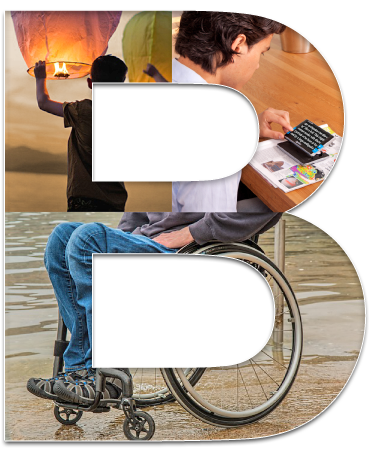 Conference & exhibition that creates awareness on assistive technology and accessibility. Online accessibility training courses in accessibility and assistive technology that are self-paced and for every level of expertise.